Detroit, Michigan - A Waymo self-driving car on display at the Detroit Moves Mobility Festival. Waymo is a subsidiary of Google's parent company, Alphabet Inc. 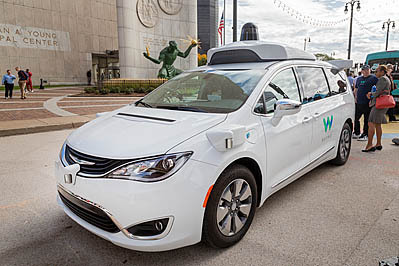 Image Description: Detroit, Michigan - A Waymo self-driving car on display at the Detroit Moves Mobility Festival. Waymo is a subsidiary of Google's parent company, Alphabet Inc.